Are you a drumstick or a flat person? I've found when it comes to wings, you're either one or the other. Personally I'm a drumstick girl; it's ever so slightly easier to eat in a daintier fashion. Although I suppose the concept of daintiness doesn't exactly go hand in hand with the act of eating chicken wings. 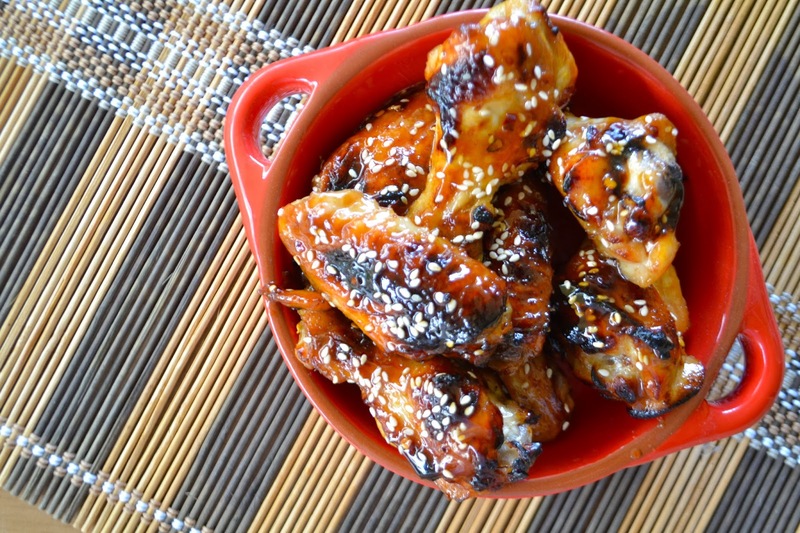 These wings are so easy to make, they don't need to be marinated for ages and are a total hit with just about everyone that encounters them! They're great party guests; you can make an absolute truckload with no effort at all. Once you try these, you'll never buy those sugary pre-marinated chicken pieces at your local deli counter again. Try and buy smallish chicken wings; the big ones are from older birds and are a wee bit tougher. 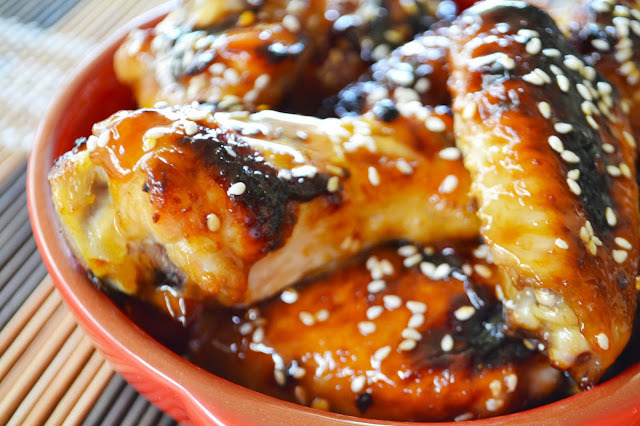 In my marinade, I use garlic, soy sauce, honey, sesame oil and some chilli flakes. The sesame oil gives the wings a gorgeous smokey flavour and the soy and honey give them a lovely, burnished colour. I don't use too much honey in the actual marinade as it can catch and burn in the oven. Instead, I brush on a bit of honey about 10 minutes before the end of cooking. This also gives the sesame seeds something to stick to. 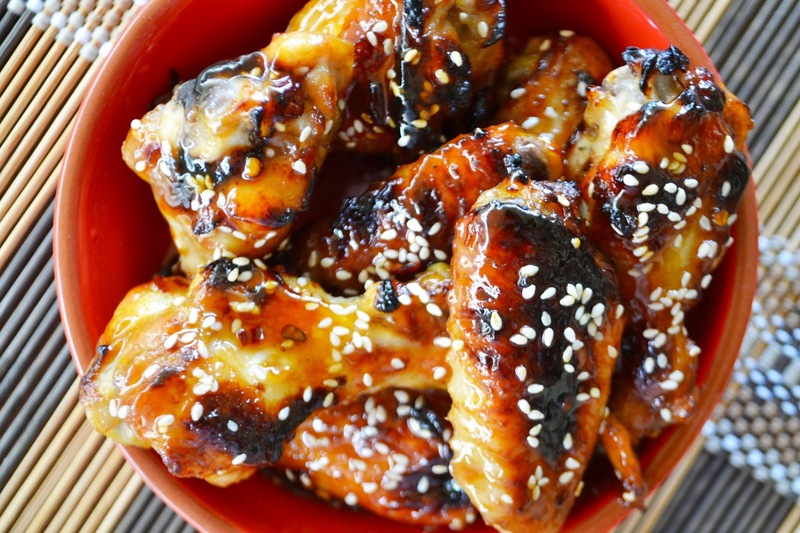 I always used to bake my wings at a moderate temperature because I was terrified of burning the sugar in the marinade and would always wonder why the skin would end up flabby and horrible. Then one day, I thought I'd take a walk on the wild side and turn up my oven... REVELATION! Instead of stewing in their own juices, the fat renders out of the chicken and not only do the wings cook faster, the skin doesn't end up with that creepy, gelatinous texture. Win! These wings are super versatile. You can marinate them overnight if it suits your purposes better but they also work with just a quick 1 hour soak. I don't normally use measurements when I make the marinade, I've given some rough numbers here, but you can always adjust to suit your own tastes. Make sure to use light soy sauce, it's saltier than normal soy sauce so you don't need to use as much to get the seasoning right. 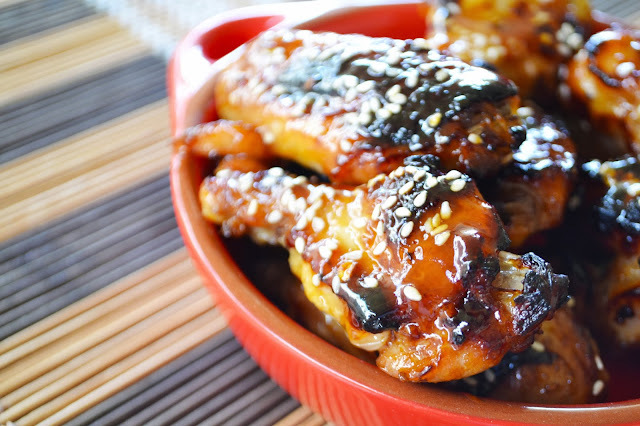 Combine the ingredients for the marinade and pour over the chicken wings. Marinate for at least 1 hour. Preheat oven to 200ºC. Drain off the excess marinade and place the wings on a lined roasting tray, skin side up. Bake for 20 minutes, turning over halfway through. After 20 minutes, take them out and brush all over with the extra honey and flip them over so they're skin side up again. Sprinkle with the sesame seeds and bake for another 10 minutes. Keep an eye on them; if your oven runs hot and the wings look like they're getting a little too tanned, you can take them out a few minutes early. Cool for 5 minutes or so before attacking with gusto!